I’m lovin’ this one, because it’s fun and bright but also because it’s so easy to make! The Yippee Skippee set used for the greeting and the Daffodil Delight Seam Binding Ribbon are on the Retiring List, but most of the supplies used will be available in the new upcoming catalog for your creating pleasure. 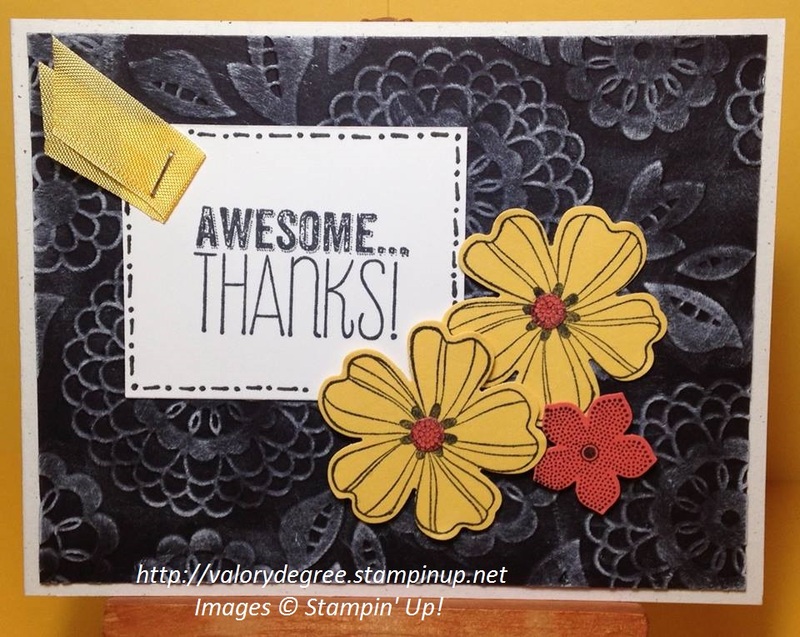 I used the Lovely Lace Embossing Folder on black card stock, then lightly rubbed a White StazOn ink pad over the surface to give it that chalkboard look. I used the Flower Shop and Petite Petals sets for the flowers and I punched out the middles using a regular 1/4″ paper punch. I finished it off by making a freehand border around the greeting with a Project Life Journaling Pen.